Parrots are real birds though, and they are visible in large numbers, outside our apartment, along with more pedestrian swallows and pigeons. The last like to nest in the window sills. These are not joke parrots, or White House parrots, or Zionist warmonger parrots. They are beautiful green birds. They are Olim Hadashim (new immigrants) from India it seems. Parrots were once apparently native to the land. 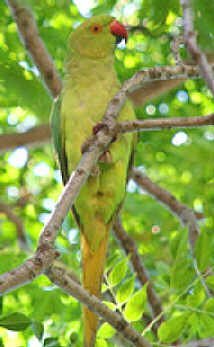 However, this variety are Drara parrots introduced from India, according to those who know. The beautiful green Indian parrot called “Drara” has undergone an “incredible multiplication” during the last few years as its predators have rapidly decreased in numbers, Dr Yossi Lasham, an ornithologist, was quoted in the daily, “Yediot Ahronot.” The rich and natural food available all over northern Israel has aided its growth and they have wreaked havoc on the date plantations in Amakim, necessitating authorities to issue directives to adopt measures to control or even reduce their numbers, Dr Lasham told the paper. “Large Drara parrot causes great damage to the cultivators of dates, apples and other fruits,” a senior cultivator, Glozner, from the Beit Shean valley said...“We have identified it as our real enemy. Following the declaration, it would be possible to make a thinning process in places where the bird was causing great damage”, the farmer said. Avigdor Lieberman, Minister of Strategic Threats, will soon issue a strategic threat, directing the Israel military industries to find a solution for the airborne menace. "The Drara parrot is harmless and the only fruit it eats are those given to it. "The parrots can be easily traced ("followed" in the original, no doubt) flying joyfully in the national parks in Tel Aviv, where there is an ongoing dialogue between those living as pets and those who managed to flee, narrating the sweet life outside the cage,"
Ms Giat does not explain how she believes the parrots existed before people fed them. Perhaps they ate mahn (manna) from heaven. We see them eating little red berries from the trees that surround our building, so they must have adapted fairly rapidly to life in the wild. The Rabbinate has not yet decided if Drara parrots are Jewish yet. If they are Jewish, they must tithe the fruits and refrain from eating in Jewish fields during shmita years. The Palestinian authority is considering protesting the incursion of these real Zionist parrots, taking over the airspace of the Palestinian people. They will tolerate only the imaginary ones that infest the pages of Al-Hayyat al Jadida and similar journals. They are nice looking birds, aren't they? Copyright - Original materials copyright (c) by the authors. Originally posted at http://israel-like-this-as-if.blogspot.com/2007/02/lets-hear-it-for-israeli-parrots.html. Please do link to these articles, quote from them and forward them by email to friends with this notice. Other uses require written permission of the author. "The Drara parrot is harmless and the only fruit it eats are those given to it." This is a typical lefty Ashkenazi traitor - speak, if I have evr seen one. Harmless, will you believe it? President Katzav speaks in code. We get it.